“Where experience makes the difference.” At our archery pro shop, this is not just a catchy slogan, it is truly what makes us different than everyone else. Every bow we sell comes set up for YOU, because everyone is different. We carefully measure your draw length and set the pull to you specific needs and strength. Try buying that on the inetnet! We’re also a full service repair shop. 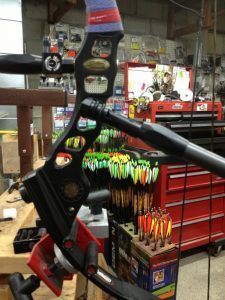 Every new bow comes with custom set up & range time to get it dialed in. First tune up is also included!